Pemberton, BC, Canada . . .
"Adventure Begins Here", in the Pemberton Valley, nestled in British Columbia's majestic Coast Mountains. Located just north of Whistler Resort, a variety of outdoor recreational activities are available including horseback riding, cycling, hiking, skiing, fishing, boating, swimming, paragliding, kayaking, golfing , snowmobiling, rafting, jet boating, glider rides, sightseeing flights, photography , bird watching, the Green River MX Track and the Pemberton Speedway. Nearby Whistler is the Number One Ski resort in North America. Pemberton is designated as a "Superhost Community" offering lodging and accommodations of all types. 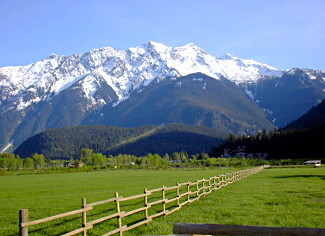 The majestic Pemberton Valley District includes the Village of Pemberton and surrounding communities of Mt. Currie, Birken and D'Arcy, British Columbia, Canada. The fertile Pemberton Valley, famous for its virus free seed potato industry, also has a number of farms specializing in fruits, vegetables and cattle. Two Provincial Parks, Nairn Falls Provincial Park and Birkenhead Lake Provincial Park, and the Joffre Lakes Recreational area are popular summer destinations complete with a variety of trails to explore. During the summer months a visit to the Historical Pemberton Museum will provide the visitors with the opportunity to learn about the history of the First Nations and white settlements in the Pemberton Valley. Accommodations: Pemberton and District, BC, Canada offers an excellent variety of accommodations and lodging for every taste and budget. Inns, lodges, motels, and bed & breakfast accommodations make Pemberton and District such a great place to stay! The Pemberton Valley / Meadows lies north and west of the Village. Travel east of the Village to Mt. Currie, Lillooet Lake, and Ivey Lake. Pemberton Weather: The climate of Pemberton is very warm and dry in the summertime and mild and wet in the winter. The regulated temperatures are created by the surrounding Coast Mountains. 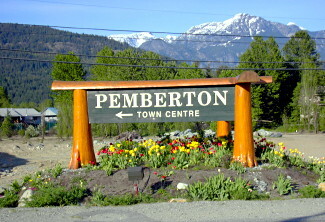 Population: Pemberton is a small and vibrant community of 2,500 people and covering 320 hectares of land. The Village is the service centre for 6,000 people which includes the communities of Pemberton, Mt.Currie, Birken and D'Arcy. Industry: The main industries are logging, farming, tourism and support services. Access: The Pemberton Valley is situated 159 kilometres north-east of Vancouver, British Columbia. The Village of Pemberton is a driving distance of about 2.5 hours north of Vancouver, BC, 1.25 hours north of Squamish and 20 minutes north of Whistler on the scenic Highway 99. It is also accessible by bus and train, taxi, and charter air service. B.C. Greyhound Bus Lines provides daily bus service from Vancouver. There are also a a number of daily scheduled trips on BC Transit bus service from Pemberton & Mount Currie to Whistler daily. Pemberton Village�s airport provides access by air to Whistler and Pemberton. A 5-minute drive east of the Village of Pemberton and 25 minutes north of Whistler off Highway 99, the airport accommodates fixed wing and rotorcraft vehicles. The Pemberton Valley / Meadows lies north and west of the Village. Travel east of the Village to Mt. Currie, Lillooet Lake, and Ivey Lake. Throughout the year there are a host of festivals and events including the Annual Winterfest in February, Lillooet Lake Rodeo in May, Canada Week Celebrations in June/July, Barn Dance in July, Slow Food Cycle Sunday in August and Equifest & Country Fair in September.